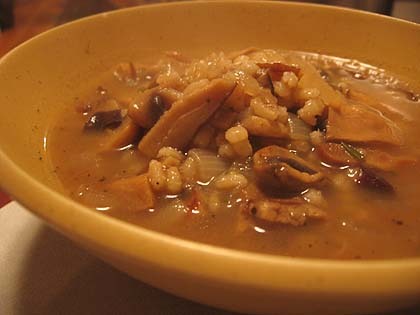 Winter Mushroom-Barley Soup: It's Creamy and Glorious! Alanna over at Veggie Venture is hosting a soup event for the month of February — Soups, Glorious Soups. When I came across this recipe in the most recent Eating Well, I knew it would be a great soup to make for this theme. It was. This turned out nice, creamy and very satisfying. Just what you want when the weather is all cold and rainy. What happened to our sun? I seriously got used to that three weeks of all sun/no rain weather. Oh well, here’s the soup you want when it’s not sunny out. Just use a sunny yellow bowl instead. Combine barley and 1 1/2 cups broth in a small saucepan. Bring to a boil over high heat; cover, reduce heat to low and simmer until the barley is tender, 30 to 35 minutes. Now, I would think you could also just cook the barley in the soup but I followed Eating Well’s directions and cooked it separately. Meanwhile, combine porcinis and boiling water in a medium bowl and let soak until the mushrooms are soft, about 20 minutes. 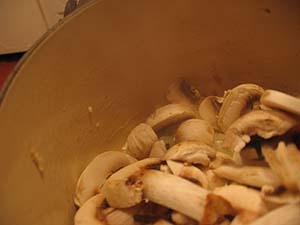 Line a sieve with paper towels, set it over a bowl and pour mushrooms and soaking liquid through it. Reserve the soaking liquid. 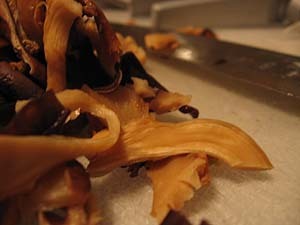 Transfer the mushrooms to a cutting board and finely chop. Heat butter and oil in a Dutch oven over medium-high heat. 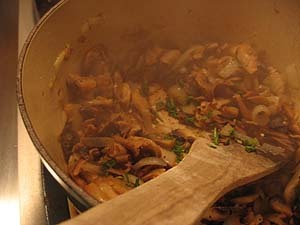 Add shallots and cook, stirring often, until softened, about 2 minutes. 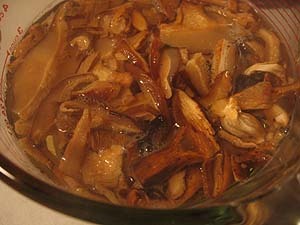 Add white mushrooms and cook, stirring often, until they have released their juices and started to brown, 8 to 10 minutes. Add the porcinis, celery, sage, salt and pepper and cook, stirring often, until beginning to soften, about 3 minutes. Sprinkle flour over the vegetables and cook, stirring, until the flour is incorporated, about 1 minute. Add sherry and cook, scraping up any browned bits with a wooden spoon, until most of the sherry has evaporated, about 1 minute. Add the chopped rosemary. Add the soaking liquid and the remaining 3 cups broth, increase heat to high and bring to a boil. Reduce heat and simmer, stirring occasionally, until the celery is tender and the soup has thickened, 18 to 22 minutes. Add the cooked barley and continue cooking, stirring occasionally, until heated through, about 5 minutes. Stir in sour cream until incorporated. Garnish with chives. 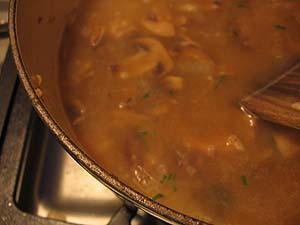 1 comment to Winter Mushroom-Barley Soup: It's Creamy and Glorious!